Chapter 1. Silicon in plants: Facts vs. concepts. Chapter 2. Silicon as a beneficial element for crop plants. Chapter 3. Silicon transport at the cell and tissue level. Chapter 4. A primer on the aqueous chemistry of silicon. Chapter 5. Silicon deposition in higher plants. Chapter 6. Silicon in horticultural crops grown in soilless culture. Chapter 7. Effect of silicon on plant growth and crop yield. Chapter 8. Plant genotype, silicon concentration, and silicon-related responses. Chapter 9. Silicon and disease resistance in dicotyledons. Chapter 10. The use of silicon for integrated disease management: reducing fungicide applications and enhancing host plant resistance. Chapter 11. Methods for silicon analysis in plants, soils, and fertilizers. Chapter 12. Silicon sources for agriculture. Chapter 13. The relationship between silicon and soil physical and chemical properties. Chapter 14. The economics of silicon for integrated management and sustainable production of rice and sugarcane. Chapter 15. Silicon research down under: Past, present, and future. Chapter 16. Past, present, and future research of the role of silicon for sugarcane in southern Africa. 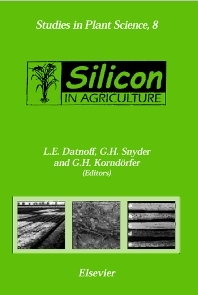 Chapter 17. Review of research in Japan on the roles of silicon in conferring resistance against rice blast. Chapter 18. Silicon from rice disease control perspective in Brazil. Chapter 19. Effects of silicon fertilization on disease development and yields of rice in Colombia. Chapter 20. Plant related silicon research in Canada. Chapter 21. Agricultural utilization of silicon in China. Chapter 22. Past and future advances in silicon research in the Republic of Korea. Poster Abstracts. Index. Presenting the first book to focus on the importance of silicon for plant health and soil productivity and on our current understanding of this element as it relates to agriculture. Long considered by plant physiologists as a non-essential element, or plant nutrient, silicon was the center of attention at the first international conference on Silicon in Agriculture, held in Florida in 1999. Ninety scientists, growers, and producers of silicon fertilizer from 19 countries pondered a paradox in plant biology and crop science. They considered the element Si, second only to oxygen in quantity in soils, and absorbed by many plants in amounts roughly equivalent to those of such nutrients as sulfur or magnesium. Some species, including such staples as rice, may contain this element in amounts as great as or even greater than any other inorganic constituent. Compilations of the mineral composition of plants, however, and much of the plant physiological literature largely ignore this element. The participants in Silicon in Agriculture explored that extraordinary discrepancy between the silicon content of plants and that of the plant research enterprise. The participants, all of whom are active in agricultural science, with an emphasis on crop production, presented, and were presented with, a wealth of evidence that silicon plays a multitude of functions in the real world of plant life. Many soils in the humid tropics are low in plant available silicon, and the same condition holds in warm to hot humid areas elsewhere. Field experience, and experimentation even with nutrient solutions, reveals a multitude of functions of silicon in plant life. Resistance to disease is one, toleration of toxic metals such as aluminum, another. Silicon applications often minimize lodging of cereals (leaning over or even becoming prostrate), and often cause leaves to assume orientations more favorable for light interception. For some crops, rice and sugarcane in particular, spectacular yield responses to silicon application have been obtained. More recently, other crop species including orchids, daisies and yucca were reported to respond to silicon accumulation and plant growth/disease control. The culture solutions used for the hydroponic production of high-priced crops such as cucumbers and roses in many areas (The Netherlands for example) routinely included silicon, mainly for disease control. The biochemistry of silicon in plant cell walls, where most of it is located, is coming increasingly under scrutiny; the element may act as a crosslinking element between carbohydrate polymers. There is an increased conviction among scientists that the time is at hand to stop treating silicon as a plant biological nonentity. The element exists, and it matters. Dr. Lawrence E. Datnoff is Professor of Plant Pathology, University of Florida, Everglades Research and Education Center. Since 1988, he has been studying the role of silicon for plant disease control in rice in Florida, USA, Colombia and Brazil, and in turfgrass in Florida, USA. His interests have included understanding the interactions of silicon with fungicides, residual effects of silicon on disease development, enhancement of host plant resistance and the mechanism(s) of resistance. Dr. Datnoff is a former Associate Editor of Plant Disease, a Fulbright Scholar and a recipient of the University of Florida-Institute for Food and Agricultural Sciences' Interdisciplinary Team Research Award. Dr. George H. Snyder is Distinguished Professor of Soil Science, University of Florida, Everglades Research and Education Center and a University of Florida Research Foundation Professor. Since 1979, he has been studying the role of silicon fertilization for rice and sugarcane grown on organic and sand soils in Florida, USA, and on Oxisols in other countries. In addition to plant responses, his interests have included soil testing for plant-available silicon, silicon analysis of plant tissue, and evaluation of various potential silicon fertilizers. Dr. Snyder is an Associate Editor of Crop Science, Past-President of the Florida Soil and Crop Science Society, and a Fellow of the American Society of Agronomy and the Soil Science Society of America. Dr. Gaspar H. Korndörfer is Professor of Soil Science and Plant Nutrition, Federal University of Uberlândia, Brazil. Since 1994 he has been studying the role of silicon fertilization for sugarcane, rice and pasture in Brazil and Florida, USA. His interests have included silicon plant responses, evaluation of potential silicon sources, soil testing for plant-available silicon, and the influence of silicon on plant tolerance to water stress. Dr. Korndörfer is also a CNPq Scholar and teaches "Use of Fertilizer and Residues in Agriculture" to graduate students.